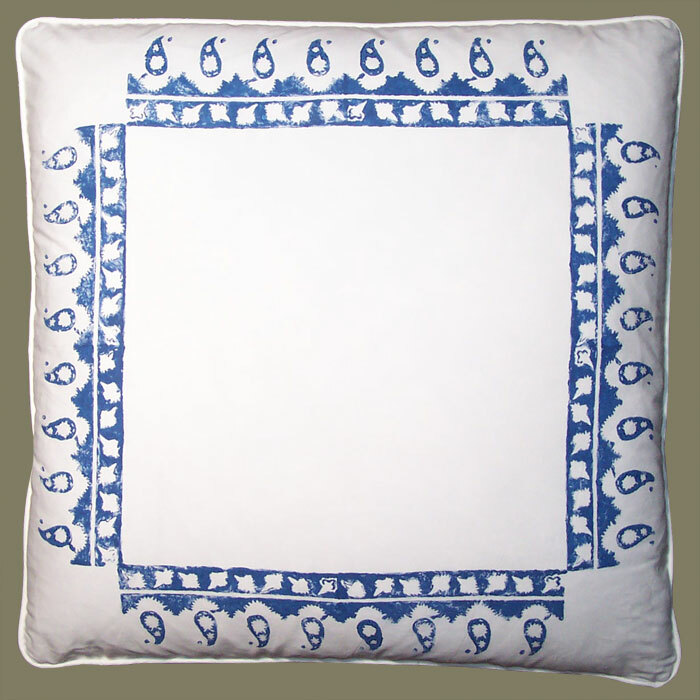 Description: Classic Blue and White Artisanaware Decorative Pillow Covers in a Hand Block Printed Paisley Design; A Border Print Utilizing an old East Indian Hand Carved Wooden Print Block. These Pillow Covers Co-ordinate with Floral Blue and White Covers A and B, as well as the Stripe and Chenille Window Pane Check Pillows, in a Delightful Study in Print and Pattern Mixing. Combine with Ornaments and Artifacts of Blue and White to Carry the Theme, or Juxtapose with the Family of Yellows and Gold and/or that of Terra Cotta and Primer Red. Rich Blue Paisley Print on Crisp, Pure White, Finely Woven Cotton.